Peugeot looks determined to set a new definition of future through its sequential concept releases. 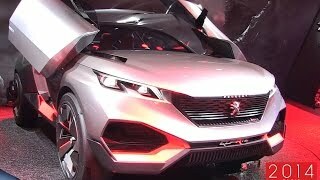 After powerful Onyx Concept followed a sedan version from the house tagged, Exalt Concept and now here we are we the SUV lineup at 2014 Paris Motor Show, Peugeot Quartz Concept 2014. With these entire futuristic concepts they definitely are gaining huge attention but what is to be seen is the production version of these. We at our end believe even if the company gets to the 80% of what they are showing us, Peugeot in no time will create divine benchmarks for the automotive market. For now let us have a look at this new concept. Basalt rock texture and digitally woven plastic recycled textile is what characterizes the interior of Peugeot Quartz Concept 2014. Listening from us this experiment didn’t interest us. However side and roof of cabin gets some leather work while cushion on seats and backs get some tawny leather work made from old clothes and furniture. After using so much of scrap in making the interior finally comes a new introduction, i-Cockpit for Peugeot Quartz Concept 2014, which allows driver to have some extra personalized driving experience. 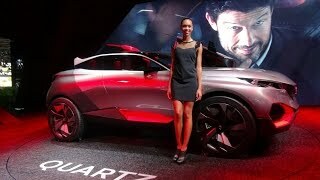 In the list of new add-ons also joins a multifunction steering wheel and a head-up display featuring some extra information linked with Peugeot Quartz Concept. 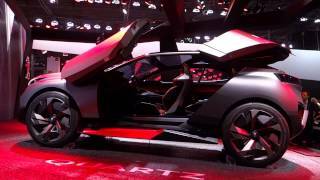 Exterior of Peugeot Quartz Concept 2014 if in any way gets to the streets as production model, this one particularly be something which neither expected nor ever dreamt of in coming future. Let us begin with the front fascia of Peugeot Quartz Concept which comes with a longer hood with louvers on each side. The inculcated louvers help in improving the airflow in and out of engine and thus maintaining the performance of model. 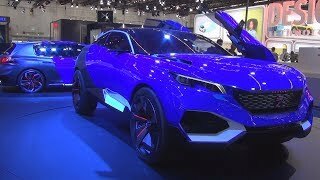 Peugeot Quartz Concept also features massive air intakes on both the sides which we believe are derived from Lamborghini. Adding best to the model from our perspective are the angular headlights, which for us added bit of aggression and class to the front. Another new aspect we noticed is placed on the side in form of electronically retractable steps. While moving around we noticed two things that for us gained all accolades in exterior of Peugeot Quartz Concept 2014; first its massive 23 inch alloy wheels and second the low-slung roof which looked like made from glass. Roof at its rear end creates a pair of spoilers which indistinctly adds to the looks of this new concept. 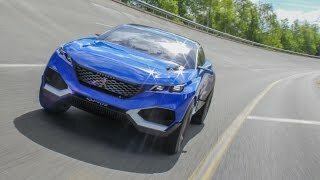 Peugeot Quartz Concept 2014 will be getting its power through a 1.6 Liter turbocharged four-cylinder engine that delivers 270 hp and peak torque of 330 nm. The output so created sublimes with one delivered by two electric motors, each of them producing 115hp and thus the engine combined together unveils whooping 500 hp.